Add style and structure to your outdoor space without breaking the bank with these DIY walkway ideas to DIY before summer begins! Hot weather is almost here! Our family loves to play games, spend some evenings popping corn and watching movies, or simply relax outside the house during summer. So our yard needs to get in shape to get us prepared for the summer to come. And the walkway deserves our attention as it connects different areas in our home. This is the reason why I am excited to share with you some of my favorite DIY walkway ideas. From gravel to brick, bluestone to concrete, these stunning DIY walkway ideas will definitely add a flair to your landscaping. Upcycling wooden pallets is a creative way to create a beautiful pallet walkway which enhances the look and style of your yard in an inexpensive and easy way. Gather some old wooden pallets and arrange them on your walkway following a creative style and patterns. You can also paint them to add a more interesting structure. Concrete is also an economical way to make outdoor walkways. You can use a wok maker to quickly form your concrete walkway. Just make sure to scrape away any mulch or loose dirt and level the pathway out before layering the gravel and the concrete. If you want to have a pebble walkway, you can buy drain rock in bulk. It is practical and inexpensive, but you need to sort the pebbles yourself according to colors and sizes. So, before working out the design, make sure to sort the pebbles first. You can use colored pebbles for a more vibrant result. And once you've completed this project, you'll be surprised how your pebble mosaic walkway captures everyone's attention. This stepping stones walkway is an easy and inexpensive way to add charm to your outdoor space. All you need is your stepping stones, sharp garden knife, garden spade, a trowel, soft sand, and your cement, to create a more inviting and functional pathway. Just ensure to lay your paving slabs in position with the right spacing and depth. This gravel walkway won't break your budget. All it takes is some shoveling and wheelbarrowing to create this quick and inexpensive gravel walkway. 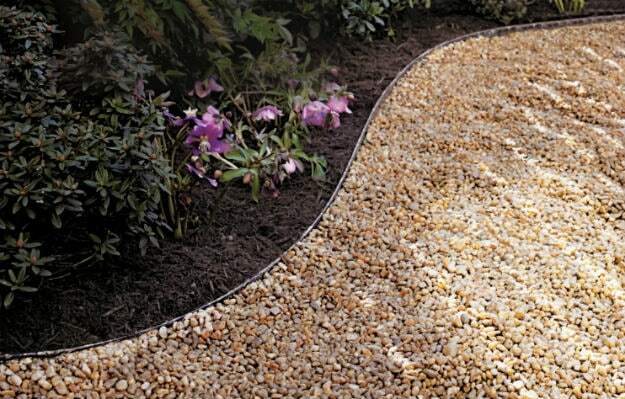 Flatten the walkway, set the borders and lay in your gravel and you'll have a natural-looking walkway. Just make sure you rake the stones to keep the path smoother and refill it with more gravel as necessary to maintain the walkway. Create a dazzling walkway out of pavers without breaking your back and your pocket. DIYing this project is not difficult. The result? A beautiful natural stone walkway that will last for years. Make sure to sweep dry, and pour the fine sand over the walkway to refill the gaps and pad tiles from each other. Flagstones make creating a stunning walkway a simple DIY project. It can be laid on a dry bed of gravel and sand or it can be mortared directly over an existing concrete. It surely adds a natural look to any walkway. A brick pattern walkway is a wonderful addition to any home and adds to the beauty of your landscaping. With some brick-style pavers, sands, and a few other tools, you'll be able to create a beautiful brick walkway for your home. Wood slices with their beautiful random patterns and design give an extraordinary look to any walkways. To start, you'll need a few logs of any size, slice them off, lay the slices out on a bed of sand and let them take your walkway to a different level of style. Finish off by putting sand and gravel over the slices to fill the gaps between rounds. Add some color and style to a plain and a little boring concrete walkway with painted stencils. All you need are a couple cans of paint, a stencil pattern, and a bit of creativity to make this unique walkway. And if it fades, just touch it up as needed. Take advantage of the different sizes and colors of tiles available and get creative in designing your own walkway. You may need to use tile spacers to keep an equal distance between tiles. The tiles are not only visually appealing, they are also easy to maintain. Give your lawn a charm and transform it into a more inviting entryway with this concrete pavers with lava rocks walkway. Just surround your concrete pavers in a cut-out bed with red lava rocks, and your walkway will surely make a statement. Lovely! Moss-laden walkway is so easy for anyone to create in the right conditions. All you have to do is pour the moss mixture carefully into the soil around the stones. Avoid putting the mixture on the stones as the moss will grow on them as well, and this could make your walkway slippery during wet conditions. It may need a little maintenance, but you'll enjoy the charm it provides. Simply enchanting! Mulch and stone are the most inexpensive walkway materials you can buy. Creating a walkway with these materials is so simple. All you have to do is lay out the edging and spread the mulch around your flat stones or stepping stones. This traditional bluestone walkway definitely gives an earnest charm to any entryway. Choose different patterns and color stands out for its timeless appeal and appearance. If you are left with a huge pile of used bricks, consider using them to create a decorative and functional walkway. Create a chevron pattern using these bricks on an angle. It's a clever way to add a whimsical feel to your outdoor space. Plus, it won't break your budget. Now, go ahead and try out some of these fabulous DIY walkway designs, and give more definition to your landscaping. Plus the feeling of joy, pride, and satisfaction of completing a project by yourself – it's priceless! Not to mention the fact that you have just added value to your property. Which of these DIY walkway ideas best fits your outdoor space? Let us know in the comments below! Looking for some hacks when it comes to small spaces? Check out this guide on making an outdoor storage bench seat for small yards!